My goal is to create the possibility for you to have a body that helps you achieve all your goals and to maintain a happy, healthy lifestyle. Born and raised in St. Louis, MO, Dr. Anderson was proud to be a personal trainer, helping people live better through exercise. His chiropractor encouraged him to visit Logan Chiropractic College as he saw that his lifestyle and philosophy of wellness aligned with chiropractic care. He visited the college and was thrilled. “I absolutely loved it. I loved their philosophy and the way they treated people.” Soon after, he enrolled to become a chiropractor himself. Dr. Anderson graduated Logan College of Chiropractic in 2011 where he earned his Doctor of Chiropractic, Master of Science in Sports Science and Rehabilitation, and Bachelor of Science in Human Biology degrees. With cupid’s arrow striking, Dr. Anderson was fortunate to meet his wife, Liz, while in Chicago. Married in 2014, the two decided to relocate to the family-friendly area of Dallas, where they could plant roots, and serve the community. Passionate about personal training and fitness, Dr. Anderson still begins his days with a great workout alongside of his wife. Staying active in church, Dr. Anderson and his wife rely heavily on their faith. We lean on our faith in every aspect of our lives. As a member of Alpha Phi Alpha Fraternity, Inc., Dr. Anderson serves the Allen community by being a positive role model. He also serves at One Community Church in Plano and is involved with the Allen Chamber of Commerce. 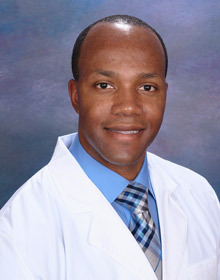 Dr. Anderson is also a member of several chiropractic professional organizations including the American Chiropractic Association, the American Black Chiropractic Association, the Texas Chiropractic Association, and the Logan College of Chiropractic Alumni Association. Give us a call and let us welcome you to our family-focused chiropractic practice in Allen, TX. We look forward to helping you achieve the life of your dreams!